On Nov. 9, 2018, the Universal House of Justice sent a letter to the Baha'is of the World announcing the establishment of a new institution at the Faith’s World Center―the Bahá’í International Development Organization―charged with the coordination and promotion of efforts being made by Bahá’ís worldwide in the field of social and economic development. Presently amounting to tens of thousands of projects, such efforts are expected to gradually expand, under the guidance of this new office, both in their number and complexity. During the ministries of ‘Abdu’l-Bahá and Shoghi Effendi, the first community of sufficient size that could begin to systematically apply Bahá’u’lláh’s teachings to unite material and spiritual progress was that of the believers in the Cradle of the Faith. The steady flow of guidance from the Holy Land enabled the Bahá’ís of Iran to make tremendous strides in but one or two generations and to contribute a distinctive share to the progress of their nation. A network of schools that provided moral and academic education, including for girls, flourished. Illiteracy was virtually eliminated in the Bahá’í community. Philanthropic enterprises were created. Prejudices among ethnic and religious groups, aflame in the wider society, were extinguished within the community’s loving embrace. Villages became distinguished for their cleanliness, order, and progress. And believers from that land were instrumental in raising in another land the first Mashriqu’l-Adhkár with its dependencies designed to “afford relief to the suffering, sustenance to the poor, shelter to the wayfarer, solace to the bereaved, and education to the ignorant.” Over time, such efforts were augmented by scattered initiatives of other Bahá’í communities in various parts of the world. However, as Shoghi Effendi remarked to one community, the number of believers was as yet too small to effect a notable change in the wider society, and for more than the first half century of the Formative Age the believers were encouraged to concentrate their energies on the propagation of the Faith, since this was work that only Bahá’ís could do—indeed their primary spiritual obligation—and it would prepare them for the time when they could address the problems of humanity more directly. Thirty-five years ago, circumstances within and outside the community combined to create new possibilities for greater involvement in the life of society. The Faith had developed to the stage at which the processes of social and economic development needed to be incorporated into its regular pursuits, and in October 1983 we called upon the Bahá’ís of the world to enter this new field of endeavor. The Office of Social and Economic Development was established at the Bahá’í World Centre to assist us in promoting and coordinating the activities of the friends worldwide. Bahá’í activities for social and economic development, at whatever level of complexity, were at that time counted in the hundreds. Today they number in the tens of thousands, including hundreds of sustained projects such as schools and scores of development organizations. The broad range of current activities spans efforts from villages and neighborhoods to regions and nations, addressing an array of challenges, including education from preschool to university, literacy, health, the environment, support for refugees, advancement of women, empowerment of junior youth, elimination of racial prejudice, agriculture, local economies, and village development. The society-building power of Bahá’u’lláh’s Cause has begun to be more systematically expressed in the collective life of the friends as a result of the acceleration of the process of expansion and consolidation, especially in advanced clusters. Beyond this, of course, countless believers, through their professional and voluntary efforts, contribute their energies and insights to projects and organizations established for the common good. Once again, then, we find that forces inside and outside the Faith have made possible a new stage in the work of social and economic development in the Bahá’í world. Therefore, on this sacred occasion of the Festivals of the Twin Birthdays, we are pleased to announce that the Office of Social and Economic Development now effloresces into a new world-embracing institution established at the World Centre, the Bahá’í International Development Organization. In addition, a Bahá’í Development Fund will be inaugurated, from which the new organization will draw to assist both long-standing and emerging development efforts worldwide; it will be supported by the House of Justice, and individuals and institutions may contribute to it. A five-member board of directors will be appointed which will function as a consultative body to promote and coordinate the efforts of the worldwide community in social and economic development. The directors will serve for a term of five years beginning on the Day of the Covenant. Operating at the spiritual and administrative centre of the Faith, the board will consult with the Universal House of Justice and the International Teaching Centre to ensure that the development work is coherent with the many endeavors of the Bahá’í world. The new institution will begin by assuming the functions and mandate previously carried out by the Office of Social and Economic Development and then gradually grow in capacity to discharge them on an expanding scale and at higher levels of complexity. It will reinforce the efforts of Bahá’í individuals, communities, and institutions worldwide to extend and consolidate the range of their activities. It will help to strengthen institutional capacity for social and economic development in national communities, including through the creation of new agencies and the emergence of advanced development organizations. It will promote, on an international scale, approaches to development and methodologies that have proven effective. It will keep abreast of findings in the development field and explore their application in consonance with spiritual principles with assistance from Bahá’ís with relevant training. It will form networks of resource persons and such institutional arrangements across continents as are necessary for carrying out its various lines of action. Above all, like the Office of Social and Economic Development before it, its primary purpose will be to facilitate learning about development by fostering and supporting action, reflection on action, study, consultation, the gathering and systematization of experience, conceptualization, and training—all carried out in the light of the Teachings of the Faith. Upon the Arc on Mount Carmel that surrounds the resting places of members of the Holy Family, Shoghi Effendi anticipated both the raising of edifices and the establishment of international institutions—administrative, scientific, and social—that would flourish under the auspices of the Faith of Bahá’u’lláh. This new institution for social and economic development will grow and evolve over the decades and centuries ahead according to the needs of humanity and under the direction of the House of Justice until the material and spiritual civilization anticipated by Bahá’u’lláh is realized in this contingent world. 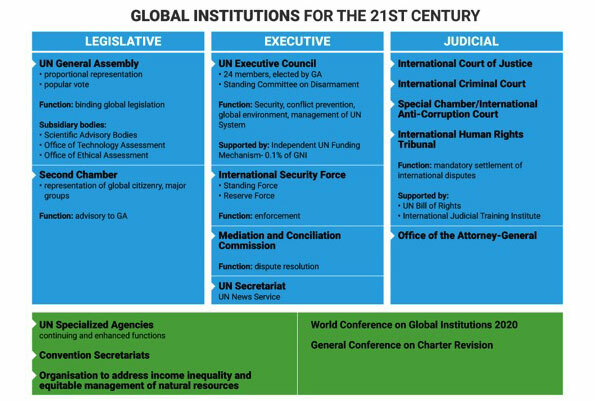 Since winning the New Shape Prize for the proposal “Global Governance and the Emergence of Global Institutions for the 21st Century”, the effort now is to make these proposals for UN reform known to a wider audience. IEF is hosting a web page for the governance project while its own web site is still under development, including a report on the awarding of the prize and a recent paper describing the evolution of the proposal. The team of Augusto Lopez-Claros and IEF members Maja Groff and Arthur Dahl has expanded with the support of the Global Challenges Foundation to include IEF members Sylvia Karlsson-Vinkhuyzen and Joachim Monkelbaan, as well as some distinguished experts including a leading anti-corruption judge from Guatemala, and a former Chief Justice and President of Bolivia. The working group met in Paris on 9-10 November to work on their book to be published next year by Cambridge University Press. They were then invited to present their proposal, along with other winners of the New Shape Prize, at the Paris Peace Forum convened by French President Macron on 11-13 November. The Forum was opened by a gathering of world leaders including the UN Secretary General and many Heads of State. This was followed by two days of debate on solutions working for peace in the world and supporting multilateralism among the leaders of 120 selected projects from around the world. 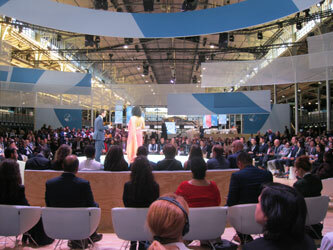 There were stands in the Space for Solutions, pitches to present the many projects invited to participate, and forums for discussion of the themes considered, with many opportunities for networking and collaboration. A declaration on trust and security in cyberspace was signed by many governments and internet companies. Launchings included a Pact for the Environment and a report on Information without Borders. A hackathon assembled 80 participants to develop 15 solutions to international problems. 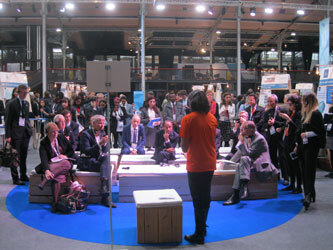 The Paris Peace Forum will become an annual event in November each year, possibly with regional Peace Forums in between. Joachim Monkelbaan has also led a team with a programme for a Sustainability Leadership Lab that has reached the semi-finals in the Educator’s Challenge of the Global Challenges Foundation, which was also featured at the Paris Peace Forum. 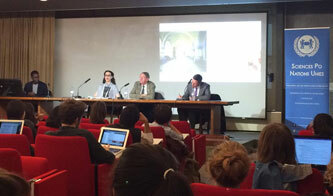 In addition to the Paris Peace Forum itself, the IEF members presented their project to an enthusiastic group of a hundred students at Sciences Po, the prestigious French university of political sciences, organized by their United Nations Association, and at two events at the French National Baha’i Centre. Arthur Dahl continued on to London to participate in a luncheon on 14 November at the British Parliament in commemoration of interfaith week and the twin anniversaries of the birth of the founders of the Baha’i Faith. The luncheon, organised by the All Party Parliamentary Group on the Baha’i Faith, was held in the Churchill Room of the Houses of Parliament, with Members of Parliament, religious leaders and other dignitaries in attendance. Arthur was the featured speaker on Integration in a World Community, describing the need for more effective global governance and outlining the proposals for UN reform. This was followed by an evening meeting for youth at the United Kingdom National Baha’i Centre. The International Environment Forum continued its longstanding collaboration with the European Center for Peace and Development (ECPD) University for Peace established by the United Nations, at its 14th international conference "A New Concept of Human Security" at the Belgrade City Hall, Serbia, on 26 October 2018. At the request of the president of the ECPD Council, H.E. Prof. Dr. Federico Mayor, former Director-General of UNESCO, IEF President Arthur Dahl was asked to prepare the Concept Note for the conference and to serve as rapporteur for the conference, preparing the final report based on the forty papers presented. He also presented a paper on Integration through shared values and shared recollections of Maurice Strong, Secretary-General of both the 1972 United Nations Conference on the Human Environment in Stockholm and the 1992 United Nations Conference on Environment and Development (Earth Summit) in Rio de Janeiro, and first Executive Director of UNEP, at a book launching commemorating his life. On 27-28 October, Arthur chaired the 6th Global ECPD Youth Forum on Youth Power for the Common Future where 26 additional papers were presented, including his own paper on "Navigating the Future with a Moral Compass". 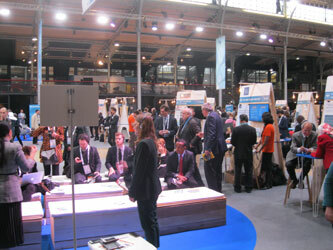 The forum included a number of workshops teaching career skills useful to nearly a hundred youth from many countries. Arthur led a discussion of the conclusions of the Youth Forum, and presented ECPD certificates to all the participants. winners of the New Shape Prize for this project in May 2018. Additional members are being added to the working group. The first product of the working group will be a book to be published next year by Cambridge University Press. On 5 November 2018, the Baha'i International Community in New York hosted an event "Global Governance in an Age of Transition: The Current and Future Role of the United Nations" featuring our proposal (see the separate report). The working group presented its proposals at the Paris Peace Forum on 11-13 November 2018. The Global Challenges Foundation (https://globalchallenges.org/en) was founded in 2012 by Swedish financial analyst and author Laszlo Szombatfalvy, with the aim to contribute to reducing the main global problems and risks that threaten humanity. The Foundation is particularly concerned about a number of risks that could threaten the existence of at least a tenth of the Earth’s population, referred to as global catastrophic risks. These include climate change, other large-scale environmental damage, politically motivated violence, extreme poverty and population growth. These five main challenges are interdependent and influence each other detrimentally, requiring immediate joint action by the world’s states. As these risks include the greatest threats to humanity, they should be on top of the international political agenda in order to ensure safety for existing and future generations. Quarterly Report of the Global Challenges Foundation November 2018, "From Idea to Prototype" includes an update on our work. In November 2016, the Global Challenges Foundation (GCF) launched a global prize competition, “The Global Challenges Prize 2017: A New Shape”, which challenged thinkers all over the world to formulate proposals for new models of how the major global risks could be managed more effectively and equitably to avoid an extreme global catastrophe in coming decades. The New Shape Prize was the biggest competition of its kind, seeking improved frameworks of global governance of global catastrophic risks. During the time it was open for submissions from November 2016 to September 2017, it received 2,702 entries from 122 countries. The New Shape Prize was awarded at the New Shape Forum in Stockholm, Sweden, 26-30 May 2018. 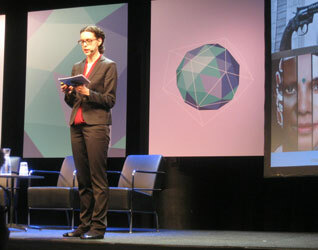 See our Report on the New Shape Forum. 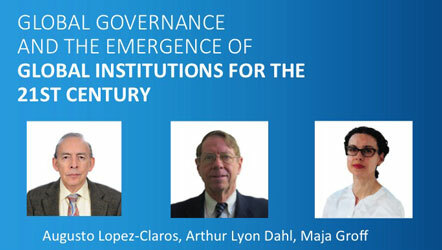 Our proposal "Global Governance and the Emergence of Global Institutions for the 21st Century" by Augusto Lopez-Claros, Arthur Lyon Dahl and Maja P.C.E. Groff, was the first of three winners of the New Shape Prize awarded on 30 May 2018.
and you can see the Full Proposal as submitted to the GCF. 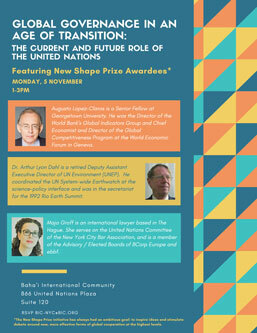 On 5 November 2018, the Bahá’í International Community United Nations Office in New York organized an event on “Global Governance in an Age of Transition: The current and future role of the United Nations” featuring New Shape Prize awardees Augusto Lopez Claros, Maja Groff and Arthur Dahl, the latter two both members of the International Environment Forum. The event was opened by H.E. Ms. Irina Schoulgin Nyoni, Ambassador and Deputy Permanent Representative of Sweden at the United Nations, and moderated by Ms. Bani Dugal, Principal Representative of the Bahá’í International Community to the UN. Augusto Lopez-Claros provided an historical perspective on global governance and UN reform, and highlighted some elements of their prize-winning proposal, including reform of the General Assembly to pass legislation binding on governments, creation of a second chamber representative of the peoples of the world and civil society, establishment of an International Security Force, and giving the UN an independent funding mechanism. Maja Groff, speaking from The Hague, described the progress made over more than a century in international treaty law, continuing up to the present with the International Criminal Court, international tribunals, and the treaty banning anti-personnel mines. Arthur Dahl discussed new global risks that have arisen since the UN was founded, including climate change; global pollution by plastics, pesticides and other products created by industry; resource depletion threatening the planetary capacity to produce food, provide water, and supply other natural resources; and inequality growing as wealth escapes from national control and corruption spreads. To respond, the UN needs a capacity for binding legislation and enforcement in these areas, scientific advisory processes to set planetary boundaries to be respected, and negotiating mechanisms to share equitably the efforts needed to stay within those boundaries. Technology assessment is also needed for emerging risks associated with geoengineering, artificial intelligence, and the use of the Internet for social manipulation, among others. In exploring practical ways forward to implement these proposals, it must be acknowledged that national sovereignty is already eroding with globalisation, and the autonomy of states today is protected best by global cooperation on these issues beyond national control. It will be important to build trust that new global institutions will act in the common interest. The example in Europe which started by ceding national sovereignty in a limited area with obvious joint benefits, coal and steel for reconstruction after the war, and once that was successful gradually expanded the scope of regional institution, could be a model to follow, perhaps starting with more binding commitments to address climate change. A number of steps forward towards reform do not require charter revision and could start immediately. If charter reform proves impossible because of the veto of permanent members, then willing governments could call a charter replacement conference, get the new organisation started with a more reliable funding mechanism, and then leave the old UN behind, integrating all that is good in the UN into the new organisation. The global governance proposals are now being expanded into a book. They include scenarios of possible ways forward, from governments agreeing voluntarily to these changes, through step-wise progress resulting from various crises, to action by the survivors after the third world war. A world conference to discuss UN reform could be held in 2020 for the 75th anniversary of the UN, coinciding also with the extension of commitments under the Paris Agreement on Climate Change. After the presentations, comments were provided by H.E. Mr. Christian Wenaweser, Ambassador Extraordinary and Plenipotentiary, Permanent Representative of Liechtenstein to the UN, who expressed concern that international law was under assault from those who do not believe in the UN and wish to return to absolute national sovereignty, and wondered how to address this. John Wilmoth, Director, UN Population Division of the Department of Economic and Social Affairs, speaking on behalf of Elliot Harris, UN Assistant Secretary-General for Economic Development and Chief Economist, highlighted the need for a rules-based multilateral system to correct the failure to share equitably the fruits of globalization which had let to the loss of confidence in international organizations. The Sustainable Development Goals had opened a new era in global governance in which no one should be left behind. The event closed with questions from the audience and responses from the project presenters. For more information on the proposals, see the page on the Global Governance working group. To read the story online, view more photos, or listen to the podcast, visit news.bahai.org. Listen to a podcast about Richard St. Barbe Baker at news.bahai.org/podcast. —The International Tree Foundation is in the midst of an ambitious plan—plant 20 million trees in and around Kenya’s highland forests by 2024, the organization’s centenary. That goal is one of the many living expressions of the ideals espoused by Richard St. Barbe Baker (1889-1982), founder of the organization. Mr. Baker, who was best known as St. Barbe, was a pioneering environmentalist and early British Baha’i who had a far-reaching vision and initiated practices that have become common and widespread today. A re-evaluation of this influential environmental pioneer is now under way, thanks to the work of the International Tree Foundation and the publication of a new biography. The recent attention comes at a time that the consequences of global climate change are increasingly apparent to humanity. Having embraced the Baha’i Faith as a young man in 1924, throughout his adventurous life, St. Barbe found in the teachings of Baha’u’llah the embodiment of his highest aspirations for the world. His deep faith was expressed in a love for all forms of life and in his dedication to the natural environment. St. Barbe noted this connection with Baha’u’llah’s vision of the oneness of humanity when he went on pilgrimage to the Shrine of Baha’u’llah.“ (H)ere at Bahji (Baha’u’llah) must have spent his happiest days. He was a planter of trees and loved all growing things. When his devotees tried to bring him presents from Persia the only tokens of their esteem that he would accept were seeds or plants for his gardens,” St. Barbe later wrote in his diary, quoted in Mr. Hanley’s book. St. Barbe also maintained a sustained contact with Shoghi Effendi, who encouraged him in dozens of letters and sought his advice when selecting trees for Baha’i Holy Places in Akka and Haifa. St. Barbe described how the inscribed copy of The Dawn-Breakers that Shoghi Effendi sent him became his “most treasured possession.” “I would read it again and again, and each time capture the thrill that must come with the discovery of a New Manifestation,” St. Barbe wrote. The International Tree Foundation, which St. Barbe originally named Men of the Trees, is just one of many organizations he established in his lifetime. It is estimated that, as a result of his efforts, the organizations he founded, and those he assisted, some 26 billion trees have been planted globally. He was so dedicated to tree planting, in fact, that he took an international trip at age 92 to plant a tree in memory of a close personal friend, a former prime minister of Canada. St. Barbe died a few days after accomplishing the purpose of that trip. “I think people should know about Richard St. Barbe Baker because his legacy still lives on,” says the Foundation’s chief executive, Andy Egan. From early childhood in England, St. Barbe was attracted to gardening, botany, and forestry. He would run among his family’s trees, saluting them as if they were toy soldiers. Later, as a young man awaiting the start of his university classes in 1912, he took a job as a logger where he lived in Saskatchewan, Canada. He could no longer treat the trees as his friends. That experience would be a defining one for St. Barbe. He decided to study forestry at Cambridge University, beginning a lifetime dedicated to global reforestation. Afterward, he moved to British-ruled Kenya, where he set up a tree nursery. While there, he witnessed the effects of centuries of land mismanagement. To honor the traditions of the Kikuyu people and promote an awareness of their significant role in tree planting and conservation, St. Barbe looked to one of their long-held traditional practices—holding dances to commemorate significant moments. From this integration of cultural values and environmental stewardship was born the Dance of the Trees in 1922. “So instead of trying to push them and force them into tree planting, he said let’s make this consistent with the culture. So he approached the elders there, discussed it with them and they had this Dance of the Trees which led to the formation of the Men of the Trees,” says Mr. Hanley. St. Barbe’s ventures into what is now called social forestry were looked upon with some skepticism. As a colonial forester, he was expected to protect forests that belonged to governments. This community-led approach remains core to the work of the International Tree Foundation. In 1929, while on a mission to establish a branch of the Men of the Trees in the Holy Land, St. Barbe traveled to Haifa to visit Baha’i sacred sites. Pulling up in his car outside of the home of Shoghi Effendi, St. Barbe was surprised to see the Guardian of the Baha’i Faith coming out to welcome him and handing him an envelope. It contained a subscription to join the Men of the Trees, making Shoghi Effendi the organization’s first life member. “He talks about the meeting with the Guardian as the most significant moment in his life, and it really…galvanized him,” says Mr. Hanley. Through a continued correspondence, Shoghi Effendi encouraged St. Barbe’s efforts. For 12 consecutive years, he sent a message to the World Forestry Charter gatherings, another of St. Barbe’s initiatives, which were attended by ambassadors and dignitaries from scores of countries. St. Barbe’s work took him to many countries. He was appointed Assistant Conservator of Forests for the southern provinces of Nigeria from 1925 to 1929. He also planned forests on the Gold Coast. In the United States, he launched a “Save The Redwoods” campaign and worked with President Franklin D. Roosevelt to establish the American Civilian Conservation Corps which involved some 6 million young people. After World War II, St. Barbe launched the Green Front Against the Desert to promote reforestation worldwide. One expedition in 1952 and 1953 saw him trek 25,000 miles around the Sahara, leading to a project to reclaim the desert through strategic tree planting. In his late 80s, St. Barbe traveled to Iran to promote a tree planting program. He stopped in Shiraz, the birthplace of the Baha’i Faith, where he was asked to inspect an ailing citrus tree at the House of the Bab, a place of pilgrimage for Baha’is. The Men of the Trees grew into the first international non-governmental organization working with the environment. By the late 1930s, it had 5,000 members in 108 countries, and its own journal for members, titled Trees. Today, Trees is the world’s longest-running environmental journal. “His legacy is probably related to the fact that he was indefatigable,” Mr. Hanley adds. “It was quite incredible—thousands of interviews, thousands of radio broadcasts, trying to alert people to this idea, and it really did have an impact on the lives of many people who have gone out and protected and planted trees.” St. Barbe’s pioneering thinking can be particularly valuable now as humanity grapples with the challenges presented by climate change. Indeed, one of humanity’s most pressing challenges is how a growing, rapidly developing, and not yet united global population can live in harmony with the planet and its resources. Earthrise tells the story of the first image captured of the Earth from space in 1968. Told solely by the Apollo 8 astronauts, the film recounts their experiences and memories and explores the beauty, awe, and grandeur of the Earth against the blackness of space. This iconic image had a powerful impact on the astronauts and the world, offering a perspective that transcended national, political, and religious boundaries. Told 50 years later, Earthrise compels us to remember this shift and to reflect on the Earth as a shared home. Watch the film online here and read about it in this New York Times article. These findings still need to be confirmed by future studies, but, if they hold up, we can conclude that global warming is much more advanced than scientists previously thought and that we have even less time to cut greenhouse gas emissions to limit global warming to 1.5°C than the recent IPCC Report suggested, which indicated the necessity of a 45% reduction of emissions by 2030 (compared to 2010 levels) and net zero emissions by 2050. The food we eat today is unsustainable for two reasons: the food system causes unacceptable environmental impacts and it is depleting non-renewable resources. The resource depletion case can be made with respect to energy, nutrients, water, soil and land. The environmental impacts include fragmentation and loss of biodiversity, significant greenhouse gas emissions, and adverse impact on marine and freshwater ecosystems including eutrophication of surface waters. The authors propose to develop an Internet of Food which will have “the ability to combine data across the whole system from farm to human”. This will “allow computation over the whole system to answer questions such as: What was the resource depletion of this product? What is the social impact of eating this product? What food safety procedures have been employed for this product? What and where has wealth been created by the value chain of this product? When these questions can be answered for specific instances of food product types and predicted for new products, then it will be possible to determine whether a specific food system is sustainable or not."